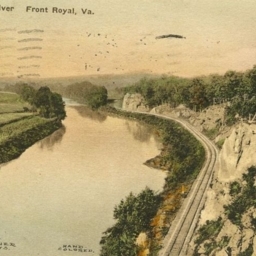 Shenandoah River, Front Royal, Va.
Postcard with picture of railroad tracks running along the Shenandoah River near Front Royal Virginia. 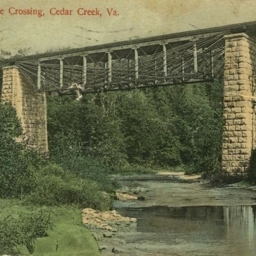 Passage Creek, near Front Royal, Va.
Postcard with a picture of the Passage Creek which flows through Fort Valley Virginia to near Front Royal Virginia. 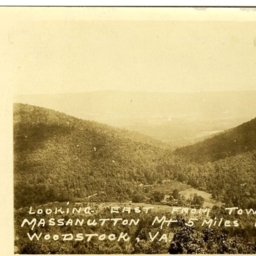 Postcard with a picture taken from atop the tower on Massanutten Mountain, east of Woodstock Virginia. 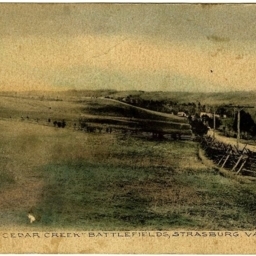 The photograph looks east into Fort Valley Virginia. 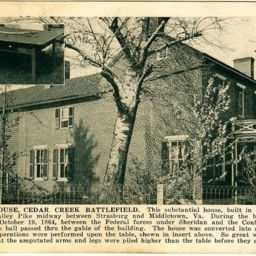 A Home in Powels Fort VA.
Postcard with a picture of a house in Powells Fort, Shenandoah County. 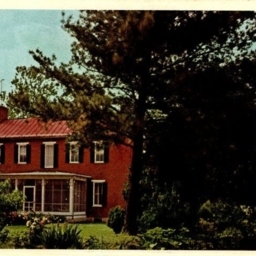 Powells Fort is the historic name given to a community in the northern portion of Fort Valley. 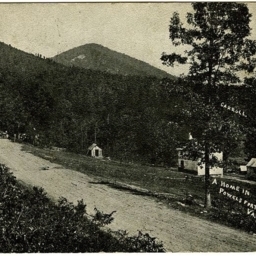 The exact location of this scene is unknown. 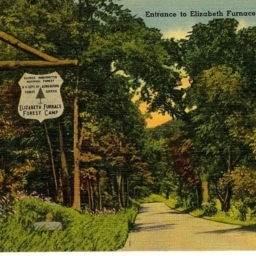 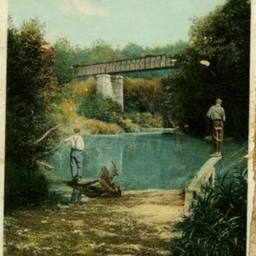 Color postcard with a picture of the entrance to what is now the Elizabeth Furnace Recreation Area in the George Washington National Forest. 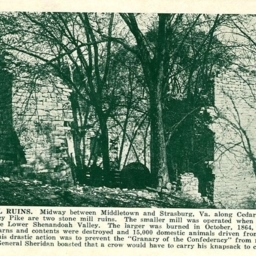 The area is located in Fort Valley Virginia near the town of Strasburg. 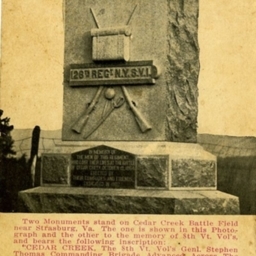 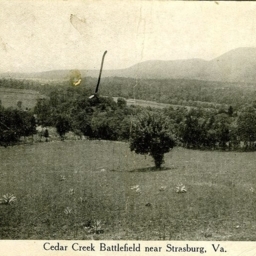 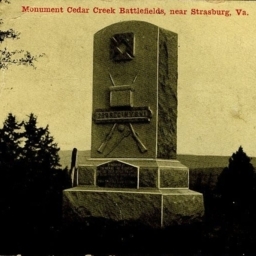 Painters Cove, Cedar Creek Battlefields, near Strasburg Va.
Postcard with a picture of Painter's Cove on Cedar Creek near Strasburg Virginia. 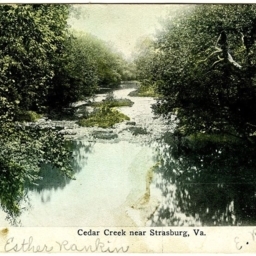 Painter's Cove, Near Strasburg, VA.
Postcard with a picture of Painter's Cove on Cedar Creek near Strasburg Virginia. 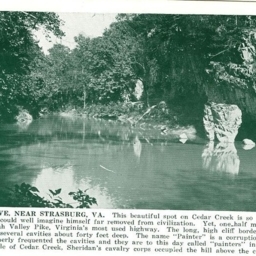 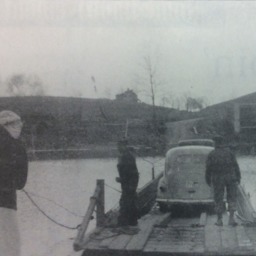 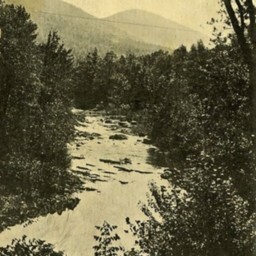 It includes a description of the site and the creek. 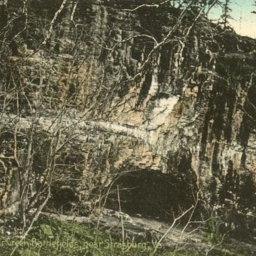 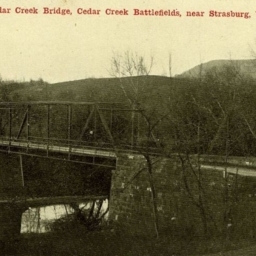 Postcard with a picture of the covered bridge that crossed Cedar Creek on the Valley Turnpike before the Civil War. 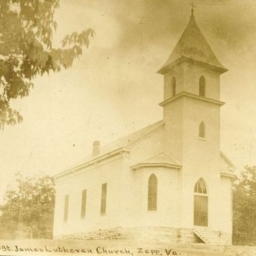 St. James Lutheran Church, Zepp, Va.
Postcard with a picture of St. James Lutheran Church located in Zepp Virginia. 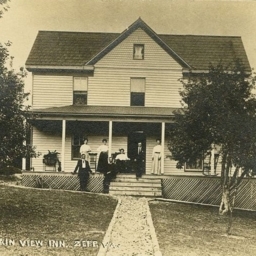 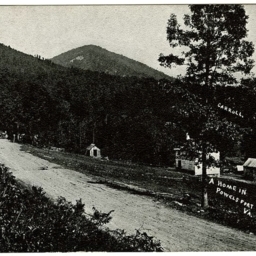 Postcard with a picture of the Mountain View Inn located in Shenandoah County Virginia's Zepp Community. 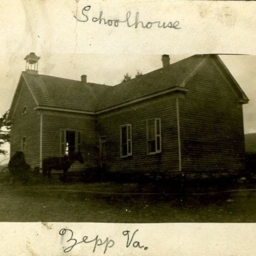 Postcard with a picture of the school building in Zepp Virginia.